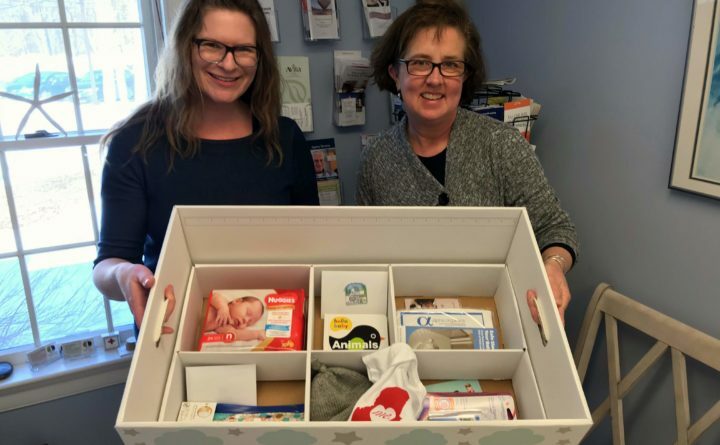 Bridget Broydrick, chairwoman of the Baby Box Program, and Kennebunkport Director of Public Health Alison Kenneway hold one of their baby boxes, care packages for new parents in town. The Kennebunkport Health Council is making a connection with new families, and offering assistance as they transition to life with a new baby. The Health Council in January launched a new Baby Box Program, providing families with new babies born in Kennebunkport with a free box — that itself is a safe-sleep bassinet — filled with goods and resources, including product samples, a board book to encourage early reading, a onesie, a handmade hat, and local gift cards for groceries and takeout food. Baby Boxes originated in Finland during the 1940s to help combat infant mortality rates stemming from unsafe sleep practices. In more recent years, parts of the United States have adopted Baby Box programs as incentive for prenatal care and education. The program is believed to be the first of is kind in the state of Maine. The Health Council also hopes the Baby Boxes will educate the community on services available through the Public Health Department. The Kennebunkport Health Council, a volunteer organization, works with the Public Health Department to implement programming to support the health and well-being of town residents. The Baby Box program is sponsored by the Kennebunkport Health Council and is funded entirely through donations, which can be sent to the Public Health Department. “The Baby Box Program will bring resources to new parents and allow town nurses to have a connection with the new family,” Kenneway said. “It will give them someone to reach out to if questions come up. We will be able to help them or point them in the right direction, and hopefully this connection will ease any anxiety. The Public Health Department sees 1,800 visits per year, Kenneway said, helping residents with health and social service needs. The department organizes blood drives, offers skilled nursing care at home and in the health office, and provides a variety of other resources. The Health Council invites local business owners to donate pamphlets and coupons for inclusion in the boxes. The Public Health Department can be reached at 207-967-4401.